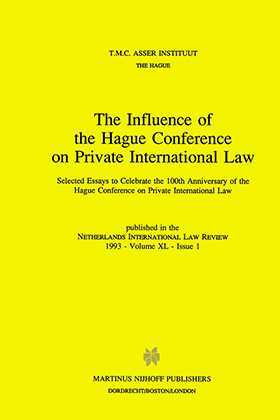 This is a reprint of the first issue of the NETHERLANDS INTERNATIONAL LAW REVIEW , volume 40, to celebrate the 100th Anniversary of the Hague Conference and the 40th Anniversary of the NETHERLANDS INTERNATIONAL LAW REVIEW . Some Recent Important Trends in Canadian Private International Law. The Influence of the Hague Conventions on Private International Law in France. The Influence of the Hague Conventions on the Development of Swedish Family Conflicts Law. The Hague Child Abduction Convention - the Common Law Response. Michael Pryles, Fernand Schockweiler and Kurt Siehr.